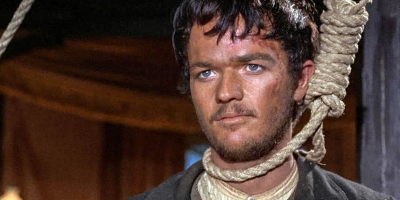 While the revenge theme of Requiescant is far from original, the notion of Lou Castel playing a quirky bible-quoting, gunslinging, Mexican orphan, itinerant protagonist is certainly a little more novel. However, compared to many titles of its ilk, Requiescant is possibly a little more heavy handed in the Marxist monologues department. So, for those sensitive to such matters, the Pier Paolo Pasolini co-written screenplay may prove to be a little too much. However, those who are able to overlook the blatant agitprop would find that there is a solid, and at times fun, western here. Indeed, Carlo Lizzani's Requiescant, with a story that involves Mexican insurrectionists, would probably make an excellent title to play back-to-back with Damiani's A Bullet for the General. Requiescant features Mark Damon. Here, he is simply delightful in his turn as the proto-fascist, self-styled aristocrat baddie, George Bellow Ferguson. His performance would probably, in itself, justify the price of admission.